ORLANDO, Fla. (CNS) — Representatives of 26 Florida parishes came to Orlando for the third annual Small Christian Community Summit with a common purpose: to listen to God’s voice speak within, prepare to respond and then go out to proclaim the Gospel. These 85 people all live in Florida but their birthplaces represent the world — New York, Ireland, Costa Rica, Louisiana, Africa, Texas, Philippines, California, Colombia, Britain and elsewhere. Sponsored by the Diocese of Orlando, the event took place at St. James Cathedral May 19, the eve of Pentecost, and drew pastoral staff, ministry leaders and volunteers. Its theme, “From Source to Summit,” echoed words from the Second Vatican Council document “Lumen Gentium,” the Dogmatic Constitution on the Church, which called the Eucharist “the source and summit of Christian life.” It also took place in a diocese whose shepherd, Bishop John J. Noonan, had declared this the year of the Eucharist. Father Eamon Tobin, pastor of Ascension Parish in Melbourne, was the keynote speaker. The priest, who writes commentaries on the Sunday readings and is the author of “Introduction to the Mass,” founded the Space Coast Alliance of Small Christian Communities, known as SCCs. The collaboration of six parishes, begun in 1992, in Brevard County developed the event. “We’re not doing anything new,” Father Tobin explained. “This is the way. What happens in SCCs is what happened with Jesus’ disciples. Jesus never intended us to walk this journey alone. He established a small Christian community with his apostles showing us the way to do the same. Luis Perez, who is from Guatemala, came to the summit with 16 others from two parishes led by Divine Word Father Cyriaque Sounou, who is from Benin in West Africa. Father Tobin has been writing commentaries on the Sunday readings for 30-plus years providing a brief exegesis of each of the three readings for a better understanding and then faith sharing questions to help participants hear and respond to the message that Jesus has for them today. 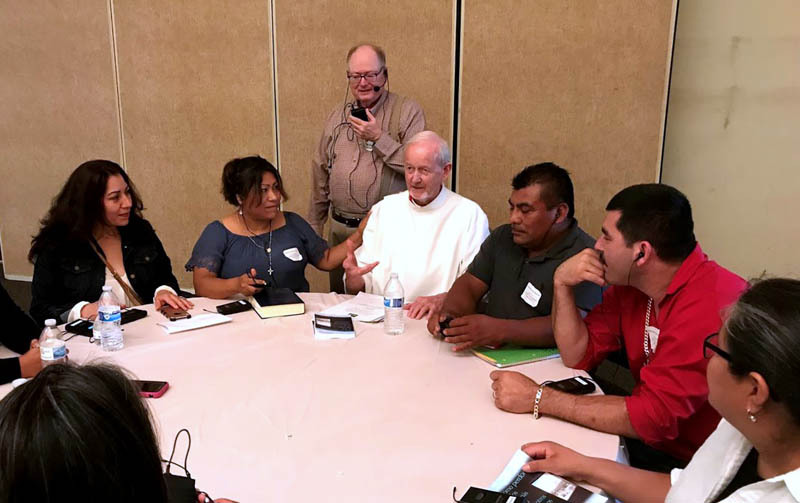 Father Tobin recently worked with Father Art Baranowski, recognized as a leading authority on Small Christian Communities to adapt Gospel-centered commentaries. — Playing a religious song helps to create a sacred space to hear God’s word. — Reading the Gospel text twice helps to the faithful to first hear with their heads for understanding and then with the ears of their hearts for the word God is speaking. — Journaling helps to respond with prayer to the word heard. The commentaries are available on the Ascension Parish website — www.ascensioncatholic.net — and can be found in English, Spanish and Vietnamese. Father Sounou expressed the same sentiment. Tomas Evans, diocesan director of adult ministry in the Secretariat for Laity, Family and Life, had an instrumental role in organizing the summit. Dodson writes for the Florida Catholic diocesan newspapers.